Berg Menu Impress your customers. Use the Berg menu theme - show the unique ambience of your restaurant in a modern and elegant way. WordPress theme menu The Berg WordPress menu theme will present the menu on your restaurant website in an appealing way. The WordPress menu plugin will ensure easy implementation and a quick start. A simple format and photos List the menu options and enhance them with photos showing the different menu categories. This will make the menu more attractive. The intuitive layout will make it easier for your customers to place orders. Showcase the best features of your restaurant and attract customers! 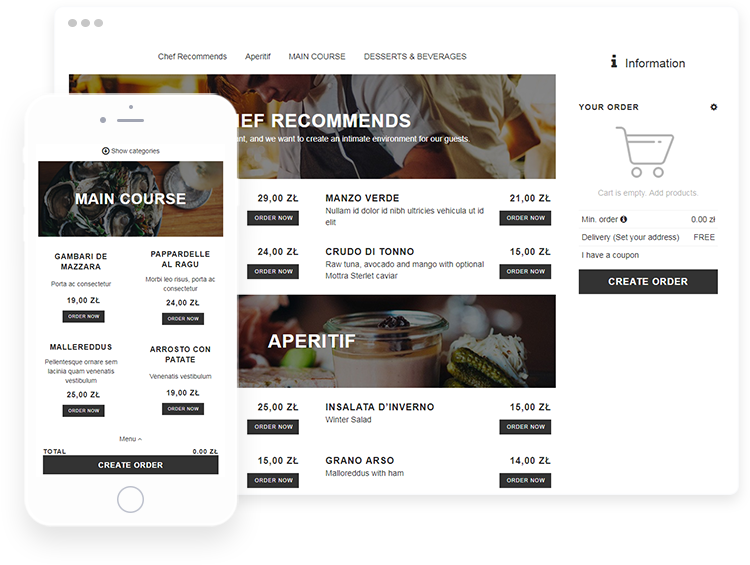 Adapt the menu to the style of your restaurant The option for changing photos and formatting text will let you adjust the Berg WordPress theme menu to the atmosphere of your restaurant. Whether you cook simple dishes or excel at sophisticated cuisine, you can show it all off using the WordPress menu template. Sell online and increase profits The Berg WordPress theme menu will help you to easily launch your own online food ordering system on your restaurant website. In this way, you will increase restaurant profits and attract new customers, while the orders are placed directly with you.